Clear creek county is in the north-central Colorado Front Range, west of Denver and immediately east of the continental Divide. 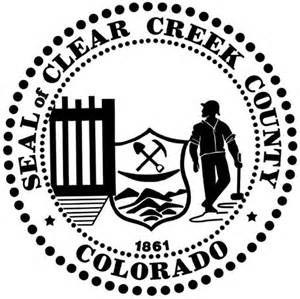 Clear Creek County ranks seventh amoung the gold-producing counties of Colorado with a total of about 2,400,00 ounces through 1959, yet gold is second to silver in the value of minerals mined in the county. Substantial amounts of lead, zinc, and copper are also produced. Most of the precious metals have been recovered from siliceous ores in lodes, but in some deposits they were byproducts of base-metal ores. From 1859 to 1864 gold was almost wholly derived from placer deposits or from the hydraulicking of decomposed outcrops of veins. Prospecting parties working westward from the first gold discoveries in Colorado near Denver discovered gold in Clear Creek County in early April 1859 along Chicago Creek, just above its junction with Clear Creek mear Idaho Springs. Prospectors stampeded to the region and shortly afterwards the first gold-bearing lodes were discovered and located. Later that year lodes were discovered in the Empire district and as far west as Georgetown.. In the middle of 1860, discoveries of silver veins in the Argentine and Georgetown-Silver Plume districts drew many mining people to western Clear Creek County. The following six districts in the county have each produced more than a total of 10,000 ounces of gold: Alice, Empire, Idaho Springs, Freeland-Lamartine, Georgetown-Silver Plume and Argentine. Of these the Idaho Springs district is the largest producer.